Amelia & Elizabeth will be happy to work with you if appointments outside these hours are necessary. Larry is proud that both of his children have followed him into the insurance field. Larry Crum Jr has his own agency and daughter Andrea Sansone is Vice-President of Larry E. Crum & Associates, LLC. 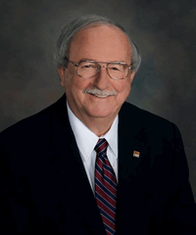 Larry E. Crum has been in the insurance business since 1967 and with Nationwide since 1968. His agency is one of the top Nationwide agencies in the United States. He is a long-time supporter of Harding Academy, University of Memphis, Memphis Grizzlies and all things Memphis! The Nationwide Insurance: Larry E Crum & Associates LLC in Jonesboro, AR provides the following products. To learn more about each insurance product, click on the links below. While you might be one of the safest drivers in Jonesboro, there's no guarantee that you'll never be involved in an accident. Larry E Crum is here to make sure you and your passengers are well prepared for any incident waiting for you down the road. To add an extra layer of protection, Larry E Crum & Associates LLC has made it easy to get the right coverage through a policy backed by Nationwide. Ready to drive off into the sunset with true peace of mind? Stop by and see us at 2005 E Highland Dr, or pick up the phone and call us at (870) 931-6300. Your home is probably your largest investment, so you want to be sure you have good insurance to cover everything from pool systems and clothing to roofs and a range of appliances. When you turn to Larry E Crum & Associates LLC, you will receive outstanding insurance coverage that begins with a review of your needs. Many unexpected events can be covered: damage from the elements, theft, personal injury to others and much more. We will design a policy that is tailored specifically to your situation, one that affords your home and family top-notch protection, and you'll be delighted to discover how easy it is. We also want to ensure that your policy remains in step with the changes in your life. For this reason, we offer periodic On Your Side® reviews to update your policy. At your convenience, just call Larry E Crum at (870) 931-6300 who will be happy to tell you more about how to safeguard your largest investment. You can also stop by our Jonesboro office at 2005 E Highland Dr. We are looking forward to meeting with you, and we'll be happy to answer any questions you may have about great insurance coverage for your home. If you are thinking about purchasing a life insurance policy in Jonesboro, you might have a few concerns about the process. You are probably familiar with purchasing insurance for your vehicles and home. However, life insurance requires you to exercise a little more due diligence. Think of life insurance as a long-term, personal investment. The right coverage can provide financial stability for your family. The wrong coverage could leave them with unexpected expenses. At Larry E Crum & Associates LLC, we work with Nationwide to provide you with many insurance options to protect your most valuable assets. We understand the need for financial security and the challenges you may encounter in achieving it. We are here to help provide you and your loved ones with friendly and professional assistance in protecting the items and people you cherish the most. You want the best rates possible for your budget. For you to receive it, you need to consider which types of life insurance you need. Making this decision is not always easy. Fortunately, Larry E Crum and any of our team members are available to assist. There is some industry language you may not be familiar with that can make it challenging for you to understand policy options. We also offer different levels of coverage with varying death benefits and payment options. Your policy is only as good as your insurer’s reputation, experience and coverage options. To learn more about our products and how they can benefit you, call (870) 931-6300 to speak with one of our team members, or stop by 2005 E Highland Dr,Jonesboro,AR,72401 to discuss your insurance needs in our office. Businesses experiencing success are likely to go through periods of rapid growth and expansion. Managers, owners, and other leaders have to think carefully about developing the strategies that will make sure that growth proceeds smoothly. If your organization has changed considerably since it was first established, it might be time to reconsider the nature of your business insurance coverage. New business owners just starting out in Jonesboro have very different insurance needs than owners of established companies. Business owners of companies in the process of restructuring, incorporating, or merging also have to think about whether their current insurance policy is really going to continue performing the right way. Larry E Crum has helped business owners adapt to changing circumstances through the application of improved insurance solutions. Here at Larry E Crum & Associates LLC we work with Nationwide to offer our customers improved policy options. We can develop customized solutions that more precisely meet the developing concerns faced by growing businesses. This is a great way to achieve the peace of mind that our insurance policies have the potential to deliver. Your company deserves the very best protection moving forward. Call us at (870) 931-6300 or visit our 2005 E Highland Dr location and speak with Larry E Crum or another member of our team. We can tell you more about the lines of coverage that Nationwide makes available. In no time, we can develop a policy that suits the work you do. Investing in protection today makes the uncertainties that come along with growth easier to handle. The Larry E Crum & Associates LLC also offers products in AL, AZ, AR, CA, CO, GA, ID, IL, IN, KS, MD, MI, MN, MS, MO, MT, NV, NM, NY, NC, OH, OK, OR, PA, SC, TN, TX, UT, VA, WA, WV, KY. Please call for information on products in those states. Larry Crum has been a Nationwide agent since 1968. He started with a card table and a folding chair in his one bedroom apartment. Many of his sales were made at a client's kitchen table where there was more room! Persistence, hard work and an American dream of success have led him and his children to a lifetime involvement with Nationwide. Now, he and the associates under his guidance have built a successful business by catering to all persons fairly. From one office we have grown to 9 locations in four states and have clients in 37 states. Our agency has a diverse sales force from many ethnic groups, and we have often been called the "United Nations Agency" of Nationwide Insurance. Our Associate Agents come from Vietnamese, Hispanic, African-American and Caucasian backgrounds. We service policyholders at 9 locations in four states in three languages- English, Vietnamese and Spanish! "No te preocupes, hablamos Espanol! We have an ongoing commitment to truly exceptional service for our customers and our friends. Our staff is highly trained to provide you with accurate answers to your questions. We take the time to explain insurance - without jargon. We carefully customize your insurance program to fit your unique needs. We provide a Nationwide "On Your Side" Review to ensure you have the protection you need as your life changes. From Home and Auto insurance as our bread and butter, we have expanded into life insurance, business insurance such as contractors, restaurants, retail stores and more. Now we are happy to offer insurance for your farm and equipment too! Larry E. Crum and Associates has been a Nationwide agency for over 50 years. We are one of the largest and most successful Nationwide agencies in the country and have a diverse sales force from many ethnic groups. Our Associate Agents come from Vietnamese, Hispanic, African-American and Caucasian backgrounds. We service policyholders at 9 locations in 4 states and 5 languages. These 9 locations serve policyholders in 37 states.